An Overview of MarineParents.com, Inc.
MarineParents.com, Inc. is an IRS approved 501(c)(3) public charity founded on January 21, 2003 to provide support, information, and services to Marines and their families, and to create opportunities for civilians to support our troops. In over 12 years of service, Marine Parents has made a huge impact in support of Marines, military personnel, and their families. Marine families are encouraged to support one another through activities and networking provided by the organization and guided by trained volunteers. Outreach to injured troops is volunteer-centered with in-person contact. Additional troop-support centered programs are designed to actively engage civilians and communities across America while maintaining the privacy of military personnel. All services are offered free to families, Marines and military personnel. Provided information and a place to connect and share® to more than 311,000 family members through a network of communities and educational websites. Tracy Della Vecchia, Founder and Executive Director, leads the operations from the corporate office in Columbia, Missouri with staff, volunteers, and a volunteer Board of Directors. In addition to the moderated, OpSEC-compliant Marine Family Network (MFN), chat rooms and informative websites, several outreach programs to support Marines and families before, during and after the Marine Corps are provided by the organization. Funding for the programs is through donations, grants, fundraising and store sales. In 2009, the 15-item online store began expansion, eventually becoming the EGA Shop. In 2010, the production facility was established on-site to design and develop custom product, dramatically boosting sales and providing additional funding for the outreach programs. The organization is an official Marine Corps Trademark licensee. 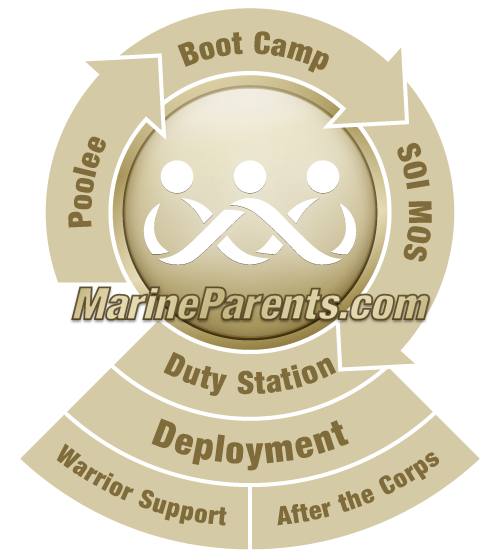 MarineParents.com provides information and guidance through the organizations programs. Team Marine Parents™ is a fitness-centered fundraising initiative funding the outreach programs. Recruit Parents™, offers support to families with a recruit in Marine Corps boot camp. What's After Boot™ offers information during schooling prior to permanent duty station assignment. The Care Package Project™ sends thousands of care packages to combat-deployed troops 4 times each year. Operation Prayers and Letters™ offers support to injured Marines in the form of letters and prayers from the public. Warrior Support Team™ offers support and resources to injured Marines, military personnel and family members. Gold Star Family Support™ supports family members whose Marine or service member has been killed in action. Operation Freedom Ballot™ provides original Iraqi ballots to families whose Marine died in Iraq. Combat Recovery™, offers support to military personnel and families with recovery issues. After The Corps™, provides guidance and information for transitioning, IRR and becoming a civilian. EGA Shop, funds outreach programs through sales of Marine-related items to Marines and family members. MFN gives the unique opportunity of connecting family members whose Marines are stationed together in Afghanistan, or whose recruits are together in recruit training (boot camp). A chat night with Dr. Bridget Cantrell for folks with questions about PTSD (Post Traumatic Stress Disorder), and assisted by trained Volunteers from the organization. Database of regional support groups for military to help folks connect with each other in their local communities. Database of US Marine Corps Units (Unit Information Pages, or UIP™ to learn about the specific unit of a family members Marine, such as location, contact information, phone numbers, mailing addresses, and more.